The Vivado® Design Suite shatters the RTL design productivity plateau by providing the industry’s first plug-and-play IP integration design environment, with its IP Integrator feature. Vivado IP Integrator provides a graphical and Tcl-based, correct-by-construction design development flow. It provides a device and platform aware, interactive environment that supports intelligent auto-connection of key IP interfaces, one-click IP subsystem generation, real-time DRCs, and interface change propagation, combined with a powerful debug capability. Designers work at the “interface” and not “signal” level of abstraction when making connections between IP, greatly increasing productivity. Often times this is using industry standard AXI4 interfaces, but dozens of other interfaces are also supported by IP integrator. Working at the interface level, design teams can rapidly assemble complex systems that leverages IP created with Vivado HLS, System Generator, Xilinx SmartCore™ and LogiCORE™ IP, Alliance Member IP as well as your own IP. By leveraging the combination of Vivado IPI and HLS customers are saving up to 15X in development costs versus an RTL approach. 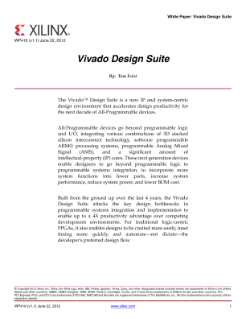 As the leading provider of Electronic System Level Design tools for programmable solutions, Vivado Design Suite System Edition provides Vivado High-Level Synthesis for C, C++ and SystemC, and MATLAB™/Simulink™ based System Generator for DSP. These solutions enable high-level IP specifications to be directly synthesized into VHDL and Verilog accelerating IP verification over 100X and RTL creation by up to 4X. The highly integrated tools can be used individually or in combination with the result being reusable IP for use in the Vivado Design Suite. Jump start your installation and design with the following videos. Learn more about Vivado by selecting the following design flows.